As I read through my own list of a hundred things to do, I realize I’m quite a simple girl. Sure, there are some fancy-dancy HUGE things on this list that are spendy and perhaps unrealistic (#11 go to Antarctica) and some things that rely more on luck than on planning (#97 make a hole-in-one), but much of what is on this list is everyday stuff that guides the mundane. I enjoy a nice cool cocktail on a hot summer day, and I love mint. 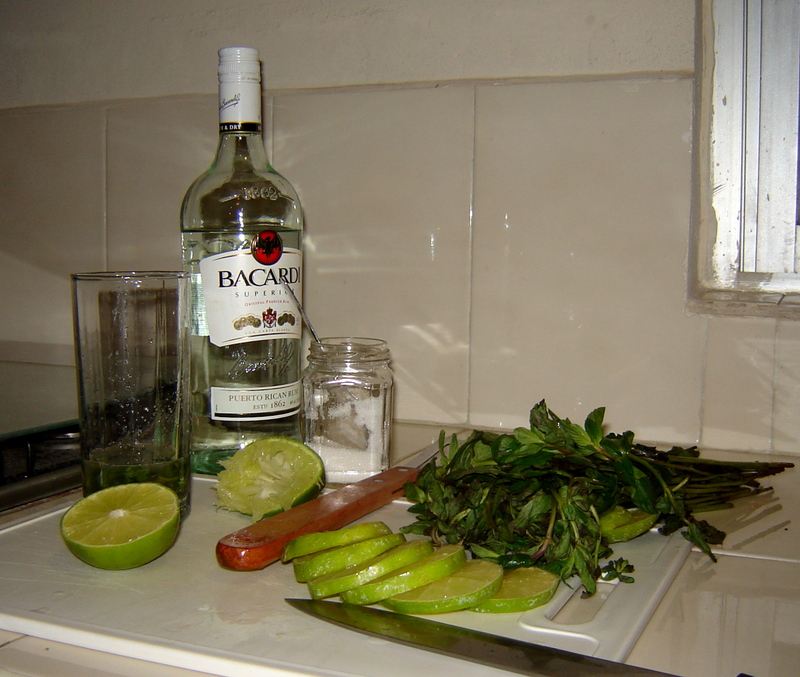 This is my recipe for a fabulous mojito, perfected in November 2009. Step 1 (optional): Make the mint syrup. The first few mojitos that I tried ended up with undissolved sugar in the bottom of my glass, so now I begin by boiling equal parts water and sugar (1 cup of each) along with a handful of mint leaves until the sugar is dissolved, the mixture smells minty and it’s boiled for a few minutes. You can tell I am a gourmet, can’t you. Drain this through a sieve and into a jar and let it cool. Step 2: Assemble your ingredients. The cooled syrup (or sugar if you didn’t make the syrup), a lime, some fresh mint (the fresher the better), rum, soda, ice and a muddler. Step 3: Muddle. Put some syrup (I usually use a tablespoon-ish; this will depend on your taste, and on how sweet your syrup is) and some mint leaves into the bottom of a martini shaker. Crush the leaves with the muddler, and then squeeze the juice of the lime into the glass and muddle again. Step 4: Shake. Add ice and rum to the shaker and shake. Step 5: Pour. Pour the entire contents of the shaker into a clear glass and add a little soda. Step 6: Enjoy. Stir with a fancy swizzle stick, garnish with a sprig of mint. Put your feet up, toast the sun, and enjoy your fabulous mojito. ~ by ktatkins on April 18, 2010.